Conversations on Nature, an exhibition of lens-based works by French artist Chrystel Lebas and Croatian artist SofijaSilvia (Silvia Potočki Smiljanić), is an ongoing collaborative project between the artists that started in London and developed over three years of intense observation and exploration of Croatian national parks Brijuni and Risnjak. A selection of the material they assembled was exhibited at the Museum of Modern and Contemporary Art in Rijeka from June 16-July 30 2011, curated by Liz Wells. This paper was delivered as ‘Conversations on Nature: time, memory and proximity in the works of Chrystel Lebas and SofijaSilvia’ at the conference during the exhibition, and appeared in an abridged version in Croatian journal ‘Kontura’ in September 2011. Above: Chrystel Lebas, Presence 30, 2010. All images © the artists, text © A. Lazar. If nature, time and temporality are the main themes of Conversations, questioning constructedness of landscape and memory is its underlying current. In different contexts, the parks underwent various cultural and political modifications that are recorded as reflections on landscape. In poetic visions of nature’s viewpoint in SofijaSilvia’s Crossings or Chrystel Lebas’ Presence series, natural phenomena merge with our understanding of death and beauty, fable and reality, recording a flow of constructed time. The closer we get, the more aware we are of our separateness from nature: shifting viewpoints between human and animal, the viewer experiences a mismatch of emotions, sensations and realities. At the time that concerns itself with narratives and counter narratives of humanism and ecocide, Conversations provide an intricate interconnection of actual, historical and conceptual time where different aspects of memory and artificiality are intrinsically linked together. Chrystel Lebas, London-based artist best known for her long exposure landscape photography, has spent nearly a year observing and photographing the Croatian nature park Risnjak, a 6350 ha forest range in Kvarner region that incorporates the upper flow of the river Kupa. Risnjak’s unique flora and fauna, as well as its specific hydrogeomorphological structure, emerge as intense and mysterious presence. Her Presence series reveal a natural phenomenon on river Kupa, the fog that materialises like a near-solid atmospheric body over water at a particular time at dusk. 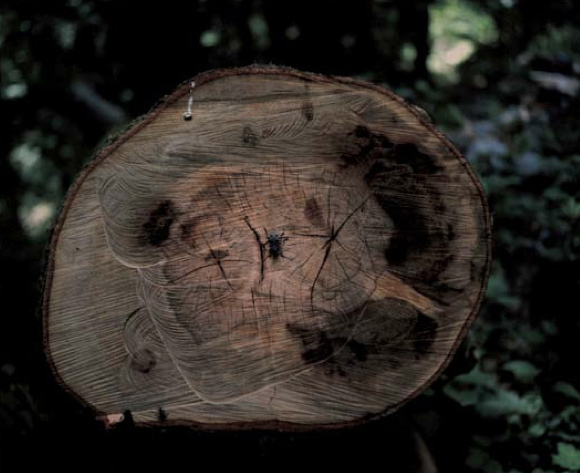 Here, like in her earlier project Between Dog and Wolf (2004-05), Lebas has singled out a precise moment when nature offers a glimpse of timelessness. The artist quotes the Russian filmmaker Andrei Tarkovsky: ‘the image is not a meaning expressed by the director, but an entire world reflected as in a drop of water’. .On her photographs, the passage of time is allowed filmic duration, recorded with unhurried exposure that slows the human time and attunes it to that of nature. 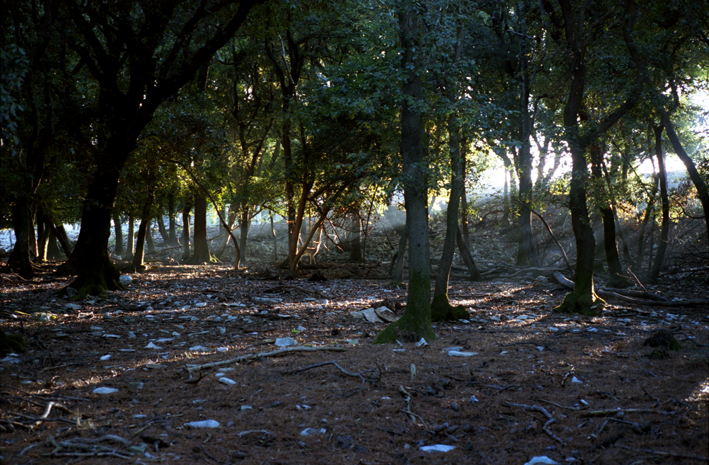 Lebas started using a high viewpoint out of necessity, during her residency in Fermynwoods, in Rockingham Forest in 2007. Suspended on the hunters’ high seat amidst the tree tops, she took hour-long exposures of forest using only available twilight light, resulting in disconcerting luminescence that resembles neither day or night. Using similar approach with images of Kupa, she captures nature with a strong sense of life, yet void of any human or animal presence. 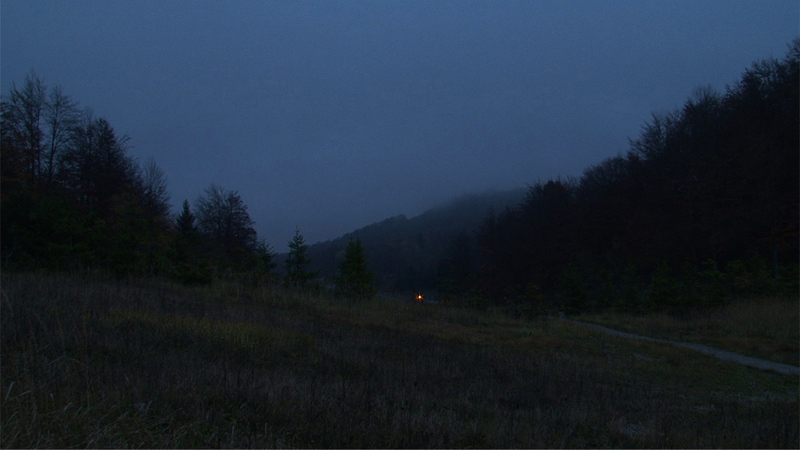 Like in her earlier series The Hour Between Dog and Wolf (2005), Lebas depicts the time ‘when twilight embodies the transition from dog and wolf, when it’s nearly impossible to tell the difference between the howling sound coming from the two animals, when the domestic and familiar transform into wild.’ [x] The passing of time speeds up when driven by curiosity: Lebas’ Histoires Naturelles are quick studies of nature taken on her walks to and from the Kupa river. They counterpoint the slowness of her epic landscapes with their minutiae simplicity. In contrast, young Croatian artist SofijaSilvia records scenes so brief that they seem imagined or staged. A doe in forest stops long enough to look back at the viewer; deer swimming across sea to the island – these moments allow insight that feels intimate and intense. This meeting of imagination and nature is a place that embodies transition. 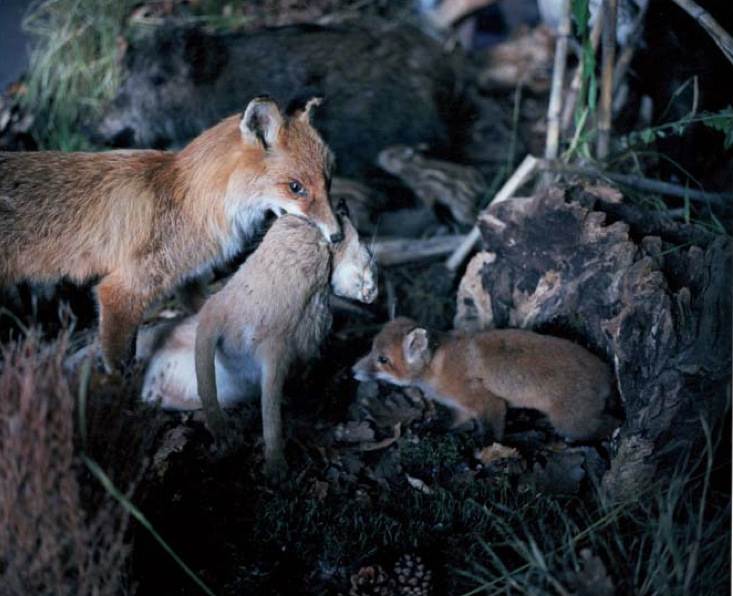 Lebas’ Scenette, or a small scene, offers an intimate close-up of a taxidermy still life of a fox family at mealtime. We can take as much time as we wish satisfy our curiosity, because the creatures are dead and will not walk away, but we remain restricted and shut out by their glassy gaze. Lebas is curious about the stuffed fox’s gaze, which tells us about desire to feel included as much as SofijaSilvia’s live doe. Both Doe’s Gaze and Scenette offer a simultaneous experience of complex, contradictory, sometimes even mutually exclusive feelings, when it’s impossible to assert our own truth or own time over the image. This feeling is fuelled by the experience of distorted actual and conceptual time. The stuffed animals appear before us in great detail and simultaneously in slow motion, giving the effect of stretching the time framework, provoking the vague feeling of strangeness. The live doe, almost unreal, equally provokes conflicting emotions and tension. The time needed to take in the scene feels stretched by fantasy. 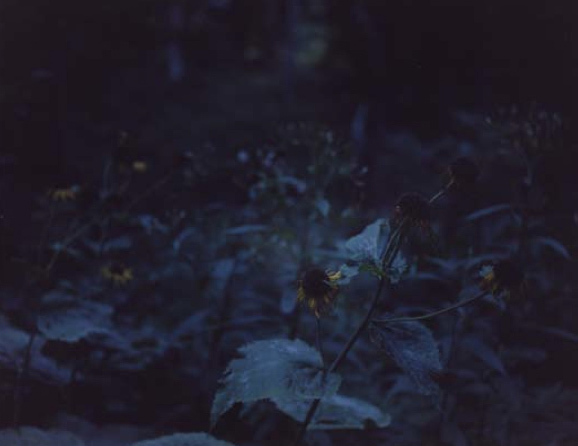 The movement and stillness of the images was reflected in artists’ physical approach to nature. Where Lebas hunts, follows the trails, only to be able to stand still in wait for the long duration of the time, SofijaSilvia roams swiftly with a hand-held Leica, collecting moments of fleeting transience. Where one ambushes the night with all its slowly unraveling sights, the other passes through it and lets it slip by. In response to landscape, they integrate themselves in land in different ways, for different durations of time and at different times of day, yet the artists maintain that their collaboration flowed from spontaneously evoking the motifs in each other’s work, responding to each other’s timbre and tone, and reframing each other’s perception through own specter and within own time-place. Impermanence in art and consumer culture of our everyday lives frequently metaphorically addresses the speed of urban lives: the mercurial but also the debased, that which is freed of all absolutes, an ultimate relative experience. We are used to seeing atomised simulacra of growing insensitivity and imagery that explores various strategies of mechanical impermanence. This is art produced on a grid between socio-historical and anthropological narrative that speaks of liberation from replication and consumption but rarely finds a path out of the metaphorical heavily signposted woods, or Baudrillard’s ‘perfect descriptive machine’. In contrast, temporality in nature simultaneously enhances humanity while reducing its scale. It allows for the time to think and the time to slow down, revealing the existence of previously unseen contexts. The nature-time reveals its own dream sequences, terrible and joyful, and allows interaction with infinity that makes our reason and feelings soar. The assembly of permanence and transience presented by the Conversations creates awareness of time that emerges in the intervals, its character and authenticity distinct. Landscapes of Conversations are revealed as unified, living structures inherent in nature, as places of dwelling and transience, but they also exist as the timeless locus amoenus, Arcadia or Eden, a ‘pleasant place’ of idealised safety and comfort. Its remoteness and its difference from urban life create a sense of detached time, the time that stands still or is considerably slowed down before our eyes. As a mental landscape, it provides respite and refuge from our temporality, although the natural cycles of its inhabitants remain unchanged. The animals may live and die, but the human eye attributes those cycles a sense of uninterrupted permanence and renewal. It is the poetic time of Arcadia, or hidden paradise; or locus amoenus of Ovid’s violent Metamorphoses; or the mysterious and dark feminine place of Shakespeare’s Midsummer Night’s Dream, teeming with passions, fantasy and unsuppressed vitality. Those multiple meanings, and multiple times, bring out the philosophical notion of endlessness as the cloth from which all human work is weaved, refracting and resonating in each image. Brijuni, the fourteen-island archipelago in the Northern Adriatic, has the history of early Roman settlements and belonged to Venice during the middle ages, only to be annexed by Napoleon and later by the Austro-Hungary. In 1893, the Viennese businessman Paul Kuppelweiser created a beach resort on Brijuni, known as the Austrian Riviera, and after the Second World War the Yugoslav president Tito retained the archipelago as his personal summer residence, frequented by dozens of state heads and celebrities. Three years after Tito’s death, in 1983, the islands became a Yugoslav (now Croatian) national park. In the aftermath of the Croatian separation from the former Yugoslavia and creation of nation-state, Brijuni provide the space for replaying and retaining social and personal memories. In the artist’s images, these memories are both subjective and collective: it is the kinetic memory of the artist’s body, trapped in physical movement and within a specific period; and it is the sensory and contextualised memory of the place. Brijuni are deeply political and historically specific, and SofijaSilvia had to recognise this legacy. The artist’s first encounter with Brijuni, from her childhood in Pula, is tinged with curiosity and the aura of a forbidden paradise. Years later, while living abroad, she realised that her memories were idealised. Her displacement led her to think of Brijuni not only as a place of great natural beauty, but also as a place that could reveal contradictions that have sunk below surface of Croatian memory. In her subsequent exploration of the islands, the artist attempted to reveal the layers of history and cultural heterogeneity alongside the cosmetically altered nature. Damnatio memoriae, or politically motivated erasure of an individual or an event, has its roots in the ancient Roman rituals of destruction and removal of all likeness of a dead emperor, erasure of his name from monuments and history, including any dates and rituals associated with his rule. This institutionalised forgetting and misuse of history has made its subsequent appearance throughout history, and the new nation-states of the Balkans were no exception. The past several decades have seen the reappearance of new ‘melancholy constructions of memory’ that can possibly be subverted by creating a place of cultural transmission and plurality. This plurality of memory, as noted by the sociologist Todor Kuljic, allows disintegration of monopoly of the past, cools the emotive imperative of ‘hot memory’ and reduces romantic and authoritarian dogmas spun by various merchants of history. Temporal distance and physical separation allows SofijaSilvia to look at Brijuni not only in fragments – as ancient Roman settlements, Napoleonic parks, Austrian Riviera or the forbidden summer residence of the Yugoslav past – but as a place of hybrid interconnectedness. 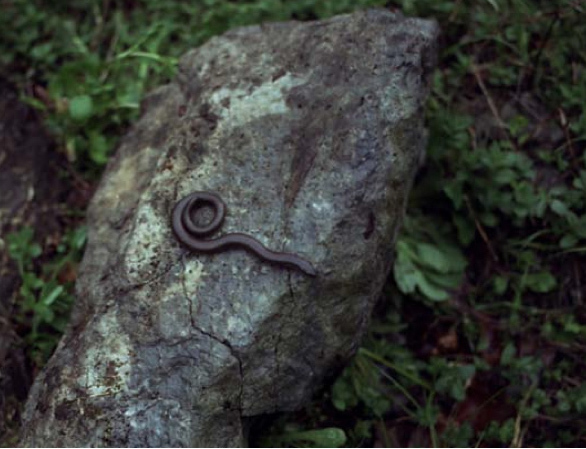 When talking about liberating and witnessing in regard to subjective memory, there are many potential discourses about disembodiment and re-enacting that relate to the experience of a woman photographer trying to record nature in motion, with a hand-held camera, allowing for vitality and selectiveness, but also presence without interference. What is obvious is that this realization was liberating for SofijaSilvia’s work and for her understanding of absence and history. Video work Kako se zoveš? (What is your name? 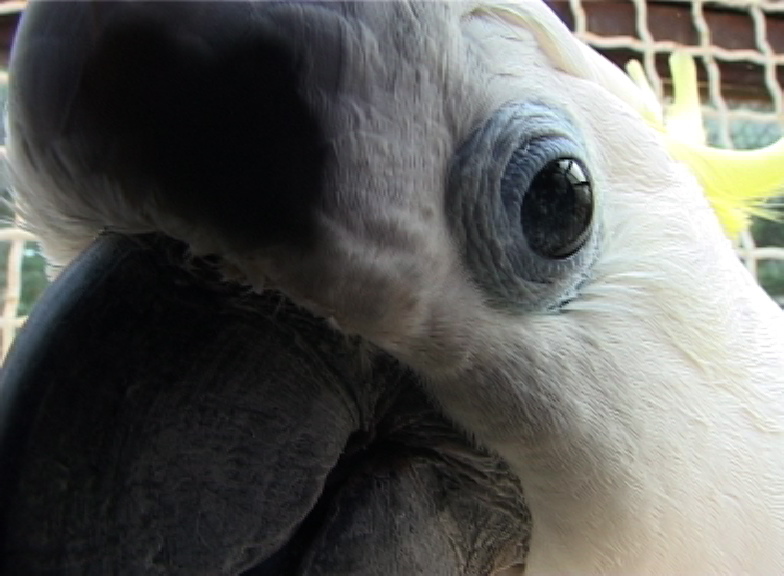 ), one of several video pieces from Conversations, features Marshal Tito’s talking cockatoo Koki who, by repeating words and phrases taught to him by the now dead statesman, stands in for false identifications of memory. Words and expressions uttered repetitively by Koki are senseless and meaningless, but repeated ad infinitum they nuance and amplify our memory. ‘What is your name?’ becomes iconoclastically funny, an automated phrase that delegitimizes and reasserts the past. Koki takes on the role of the unseen viewer, repeating learnt phrases from the past that recall information and enable transmission of linguistic, epistemic and embodied practices into collective memory. Lebas’ Histoires Naturelles form a constellation of small images that depict detailed studies of plants. Observed at close range, they invariably come out of darkness, shot at a nocturnal hour edging towards dawn or dusk. Recorded during walks between more scenic locations, these images suggest a transition and connection between past and present. Captured at child level, they record floral language that evokes the intense childhood truths of shape and sensation: colour, detail, scent. Those basic shapes and sensations bring out the primal affections in the viewer: our tenderness, fear, love, or sorrow. Like in an aimless childhood ramble, we are faced with a mixed promise of toxic beauty and dangerous fascination, burst of colour and movement that come out of monotony of the darkness, a possibly endless number of shapes and variations to feed our imagination that are interwoven as place marks on our journey. These miniature expressions are dense with poetic suggestions, each evoking a piece of memory puzzle. Although experiences that they describe are particular, together they evoke the universal and atemporal. The miniatures of Histoires Naturelles can easily remain indistinct, due to their capacity to be absorbed into landscape or remain hidden behind more permanent images and sounds; but Lebas observes their singled out voices, vague intimations, drawn out of darkness, autonomous for a brief moment in order to enrich the resonance of the broad, sweeping landscapes. Lebas quotes Agamben’s tale about people kicked out of a city who sought refuge in a forest; soon they became like animals. A story about longing, self-discovery and nature easily becomes a story about awakening of our animal selves of our childhood. Shortly before seeing Conversations on Nature, I went to see Olafur Eliasson at Tate. Eliasson notoriously uses temperature, moisture, aroma, and light to impose specific physical sensations on his viewer, posing a question how do we take in the world. Conversations do the opposite: we are invited to approach the constructed-natural and then slowly saturate our senses by evoking distant memories, fears, desires. This deliberate memory- (as opposed to sensory-) infusion is particularly present in Lebas’ video Tracking Nature, and its naturalistic use of sound. 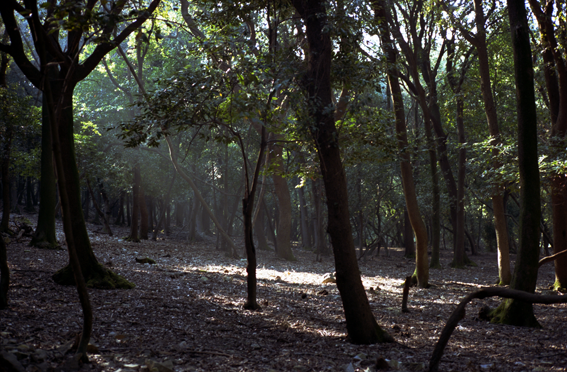 The camera records a morning scene when the light slowly appears through the misty landscape. The lens rotates incrementally slowly, to allow view of the wide bridge built for animal crossing. This is when the position of the film changes: we realize that we’re suspended above a man-made landscape, surrounded by seemingly intact nature, yet drowned in hum which we slowly come to recognize as cars on the motorway under the bridge. The motorway that cuts through the wild animal territory is what necessitated the bridge in the first place. While the hum of cars and the looming view of expanse of woods compete for our attention, our viewpoint becomes the viewpoint of an animal attempting to cross the bridge. We rely on sound alone to deliver the message of alienation and tension. The complexity of the crossing could only be recorded with video, to avoid complicating it visually. Sound is thus not just an appendage to the image, nor does it merely intensify the impression; it actually opens up something entirely different and new. The viewer’s attention is drawn to the fact that he or she is, apparently, suspended in a man-made crossing, and this prompts and widens the range of their experience. Human or animal, she is rooted in both worlds, but can no longer ignore the entwining presence of both. Attention remains split while duration makes the sensation heavier or more transparent, subtler, more emotive, easier or harder to ignore. On the brink of audibility, the Bergmanesque sound becomes their rope, a material of life. The unspoilt nature becomes a fantasy, an emotive reference that we can return to by simply exiting the sound frame. 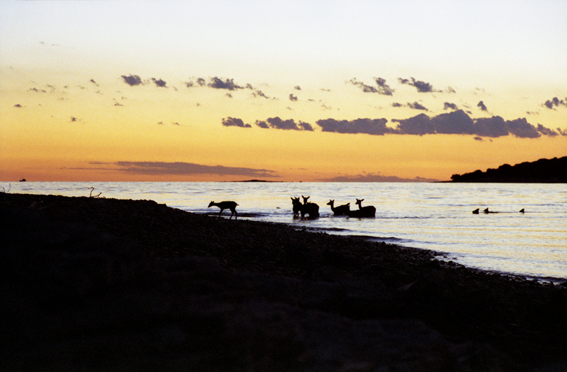 SofijaSilvia’s Crossing is a composition video of deer swimming from the mainland across salty water to reach the island. Images and sounds of the piece are not matched in real time – in fact, they were recorded on separate occassions during different crossings. This split reality fulfils a different role than the sound in Lebas’ Tracking Nature. Our ability to hear accurately is impaired or tampered with, while the temporal displacement contribute to the fabulous and the constructed. The sound is not technically manipulated but it remains artificial, highlighting the notion that our experience and memory are not the same, but may merely support one another. The documentary element of the recording gone (and separated from the event), Crossing allows the viewer to adapt its form and meaning, creating witness-memory. 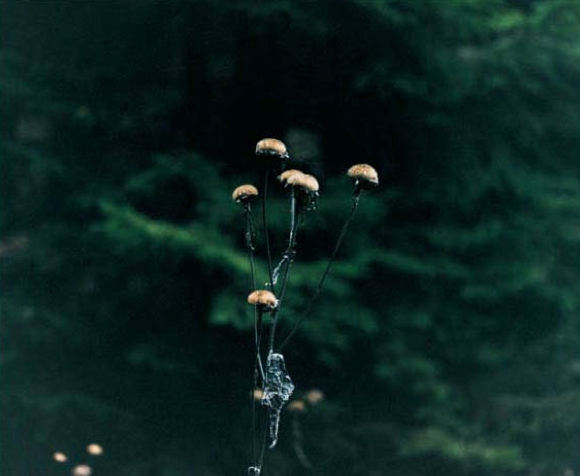 Conversations on Nature is a study of proximities: not only as a physical notion of distance and nearness, (embodied in the juxtaposition of works in space, and in distance of artist/witness), but also as a way of relating to the mixture of real, unreal and surreal, as well as a way of critically viewing past, present and future. It observes where we are in relation to where we dream ourselves to be. It is those proximities, not boundaries, that define the place between dog and wolf, human and animal. It is no longer a dividing line but a fluctuating space repeatedly crossed, tracked, marked. Our fascination with nature guides us to patience, a place of allowing something to happen, where the choice between lingering, wait or movement determine the encounter. Tarkovsky, Sculpting in Time: Reflections on the Cinema, Austin, University of Texas Press, 1996, p. 110.